Members of the 2016 All-Over the Mountain Baseball team include, first row, from left: Brock Guffey, Hoover; Noah Barron, Hoover; Carson Griffis, Homewood; Josh Miller, Homewood; John Marc Mullins, Homewood; Luke Hartman, Mountain Brook. Second row, from left: Coach Derek Irons, Oak Mountain; Christopher Vacarella, Hoover; Tyler Williams, Hoover; Samuel Strickland, Briarwood; Sonny Potter, Vestavia Hills; Parker Hershey, Vestavia Hills; Clay Stearns, Mountain Brook. Third row, from left: John McDonald, Oak Mountain; Will Battersby, Spain Park; Bryan Sanderson, Spain Park; Mason Williamson, Oak Mountain; Gene Hurst, Oak Mountain; Caden Lemons, Vestavia Hills; Christian Cusimano, Vestavia Hills. Not pictured: Luis Fuentes, Briarwood; Matt Cerfolio, John Carroll Catholic; Nathan Hospes, Vestavia Hills, and Joseph Hartsfield, Oak Mountain. Photos by Marvin Gentry. Sonny Potter’s genetic makeup might suggest that he’s a fine athlete. His grandfather was Jimmy Sidle, an All-American quarterback at Auburn University in the early 1960s. While Sidle’s footsteps are large, his grandson more than filled them in the 2016 baseball season. Potter was a driving force for Vestavia Hills as the Rebels posted a 30-8 record, at one time ranking second in the nation among high school teams. On the mound, the senior pitcher posted an 8-2 record with 91 strikeouts and only 15 walks. Potter posted a microscopic ERA of .889. 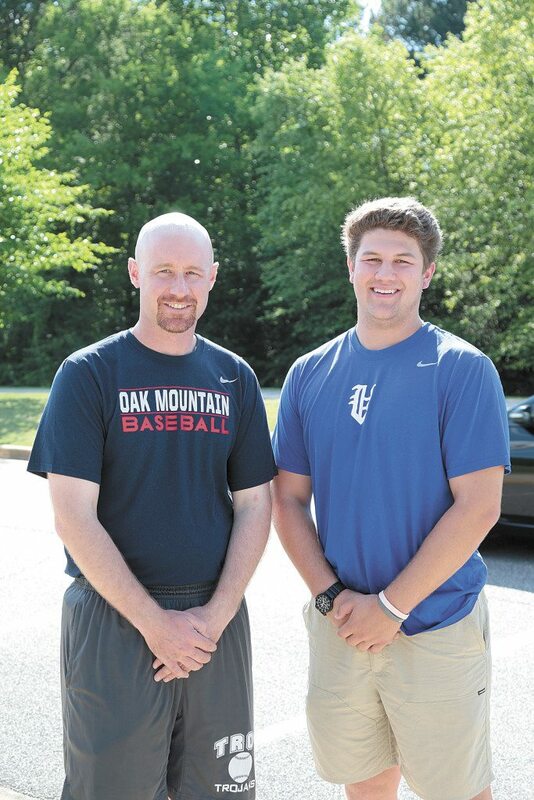 Pictured are, from left: Coach Derek Irons of Oak Mountain, the 2016 Over the Mountain Baseball coach of the year; and Sonny Potter of Vestavia Hills, the 2016 Over the Mountain Baseball player of the year. He was also outstanding with his bat, hitting at an average of .295 with 23 RBIs and four home runs. As is the case with most great athletes, Potter doesn’t mind when the burden of a game falls on his shoulders. “At a school with a tradition like Vestavia’s, pressure is a privilege,” he said. Potter’s ability to perform under pressure made an impression. He was chosen in an exclusive poll of Over the Mountain baseball coaches as the 2016 Over the Mountain Baseball Player of the Year. The coaches also chose the All-Over the Mountain baseball team. Potter credited his coaches and teammates for his success. Although his high school career has ended, Potter’s life in baseball will continue. He’ll play for the University of Alabama next season. The coaches also chose Oak Mountain coach Derek Irons as the 2015 Over the Mountain Baseball Coach of the Year. In his first season, Irons lead an unheralded Eagle team to a 33-14 worksheet and fell one game short of reaching the state 7A finals in Montgomery. Irons came to Oak Mountain from Charles Henderson High School near Troy. Potter was joined on the All-Over the Mountain team by Rebel teammates Christian Cusimano, Parker Hershey, Nathan Hospes and Caden Lemons. 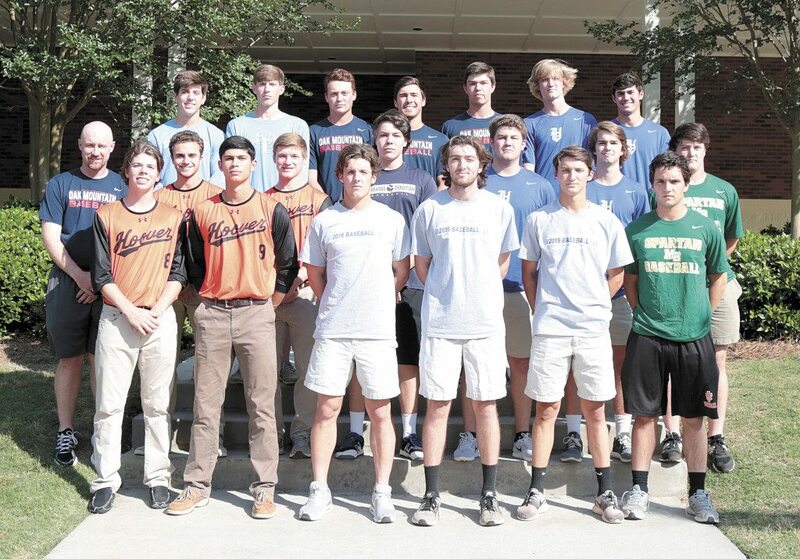 Other players qualifying for the team were Luis Fuentes and Sam Strickland, Briarwood; Matt Cerfolio, John Carroll Catholic; Carson Griffis, Josh Miller and John Marc Mullins, Homewood; Noah Barron, Brock Guttery, Christopher Vacarella and Tyler Williamson, Hoover; Luke Hartman and Clay Stearns, Mountain Brook; Joseph Hartsfield, Gene Hurst, John McDonald, and Mason Williamson, Oak Mountain; Will Battersby and Bryan Sanderson, Spain Park. Follow the link for the All-OTM softball team.